The Norwegian Krone posted a second straight week of losses against the Swedish Krone after the currency pair traded sideways for close to nine weeks. The declines for past week saw the NOKSEK fell by -1.77% while posting a combined decline of -3.69% over the past two weeks. Prices closed at 1.0190 as of Friday and the price action in NOKSEK is starting to show increasing possibility that the currency pair might reach parity soon. 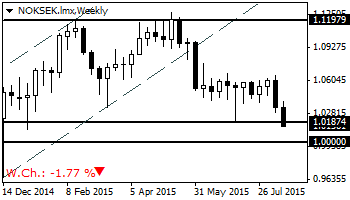 On a fundamental level, the decline in the Norwegian Krone comes amidst a renewed slump in Global crude oil prices. 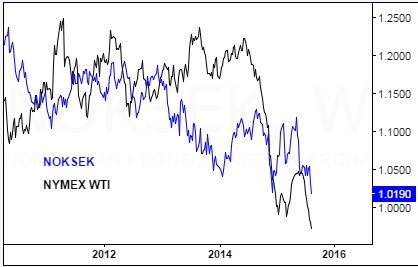 The NOK has been closely tracking the declines to the Crude Oil prices and the first chart below shows the weekly comparison between the NOKSEK and the NYMEX Crude Oil futures. While the Norwegian Krone briefly managed to lead Crude oil prices, the short term bounce in prices failed to hold on to the gains as The Norwegian Krone gave up its gains dragged down by Crude oil prices. In terms of the economic data, it was evident that the SEK was clearly outperforming the NOK going by the economic data released for the past two weeks. Inflation rate year on year grew a slower pace at 1.8%, down from 2.6% previously while producer price index continued to decline at a rapid pace, falling -6.6% and down from -4.9% declines a month ago. The only silver lining was the GDP growth rate for the second quarter which on a YoY basis, grew 2.2%. On the other hand, the inflation rate fell at a more subdued pace of -0.1% but the SEK got a boost largely due a pick in the unemployment rate, which fell to 6.5% after rising to 8.5% previously. The NOKSEK which was previously trading in an uptrend since early November 2014 hit the highs of 1.12 in May this year, a resistance level that was tested previously around August 2014. A test of the resistance at 1.12 saw the NOKSEK start its decline on breaking out off the rising price channel as shown in this first chart. Price action evidently touched down to the lower support at 1.0185 and is currently trading in just 185 pips off the 1.0 level of parity. NOKSEK briefly tested parity a few times in 2003 – 2004 but prices were sharply rejected at this level. The only clear test of support at 1.0 came early on in May 2000. A break of parity at 1.0 could no doubt shift the scales significantly for NOKSEK although we expect to see some kind of bounce at least during the first interaction to this level. Looking at the current price action there is also the possibility of a break out in the longer term, going by the falling wedge/triangle chart pattern that is currently playing out. To the upside, price will need to clear the short term broken support at 1.03444. If this level opens up, NOKSEK could eventually see a rally towards 1.06536 which marks the next major level of mention, while ultimately, NOKSEK could see a test back to the break out level of the rising price channel near 1.098 level. 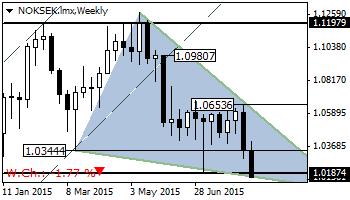 For the week ahead there are quite a few economic releases from both the Nordic economies. Sweden’s PPI is due on Tuesday, 25th August with the median forecasts expecting to see the producer price index rise 0.1%, a modest growth from 0.5% previously on a yearly basis. Retail sales data for the country is due on Friday the 28th of August where expectations are for the yearly retail sales to rise 5.4%, up from 3.8% in June while on a monthly basis, retail sales are expected to remain steady at 0.4%. From Norway, the unemployment rate is the first release this week on Wednesday 26th August with consensus estimates of 4.3%, unchanged from a month ago. To conclude, the NOKSEK looks increasingly evident that a test to parity is definitely on the cards. How prices react from this level will be everyone’s interest, but we do expect to see some consolidation, if not a bounce take place at parity ahead of a potential correction on break of 1.03444.